Have you ever been mesmerized by squirrels skittering across plank fences, by winking stars on frigid nights, by rushing streams in shady creek beds, by hearts of spring roses, by newborns gazing upon the fresh world around them? Such surprises suggest another realm closer than our next heartbeat. Thrust outside time, we pause, then enlivened by freshness, we move on to the next task. It is precisely this experience that Susan Vreeland captures in her novel, Girl in Hyacinth Blue, the name she gives to an unaccounted canvas, created by the Dutch Neoclassic painter, Jan Vermeer, in the 1760s. And such a young girl she is! Her sun-bathed profile seized by an inner awakening, pulls her away from her mending, her hand, idle, palm up. She is elsewhere. An unseen presence will somehow companion her on her life-path still to be experienced. Thus her varied owners from the present time to its composition in Delph, the Netherlands, seek entrance into her world, one that disturbs, encourages, or soothes. Her stillness, her innocence feeds them. This young girl’s yearning also took me back to endless afternoons in the workroom of the Kenwood noviceship where I stitched cache numbers on the clothing of in-coming postulants. From my chair in front of the window, my blue and white striped apron covering my black habit, I gloried in the branches of a gnarled gingko tree; its voice soothed my raw spirit, a respite until the next bell rang that called me elsewhere. So what lays beyond these momentary gaps in consciousness, so unexpected, yet heartwarming, this stillness that dissolves restlessness and paradoxically opens onto harmonious activity? How access this realm? 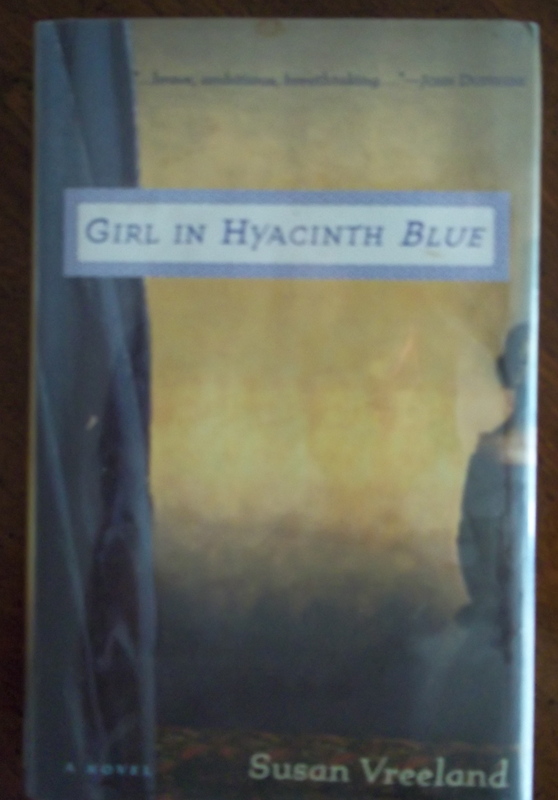 To return to Girl in Hyacinth Blue, Susan Vreeland imagines the Dutch painter Vermeer speaking of such moments that inspire his creativity, “… grounded in deep beds of contemplation, the only way living things could be stilled long enough to understand them…” Hence the still life subjects of his canvases reveal worlds of activity. To me, this suggests the presence of the Sacred Feminine, informing our perceptions. Such was my experience studying Girl in Hyacinth Blue. Its memory still touches me.